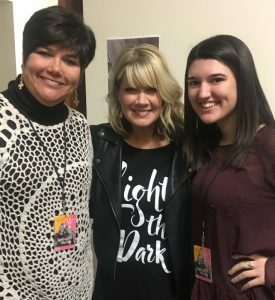 Morgan and I went to the Dare To Be evening with Natalie Grant and Charlotte Gambill in Louisville, KY Sunday evening. It was a wonderful evening beginning with Natalie and her beautiful God-given voice to sing several of her songs followed by an encouraging message from Charlotte (who is from England and so fun to listen to!) She is a dynamic speaker. This is where YOU come in. The message hit home to everyone. 1) What is God calling you to do? 2) Charlotte encouraged everyone to step outside of our comfort zone and allow God to work in our lives to bring others to Him. 3) She talked about David being a great example of that and how Saul became jealous and Jonathan became David’s supporter. 4) We all have Sauls in our lives who are jealous and negative and never support what God has called us to be. 5) But never give up because God will also bring Jonathans along to support us and encourage us in Christ. There was a moment where everyone stood and held hands with the people to our left and to our right and even across the aisle to show how we can fill in the gaps across this world if we work together for Christ. She prayed over us and asked us to squeeze the hands of the person we were holding if we believed that statement of prayer could be for her – whether we knew her or not. It was amazing how powerful it was as our hands were squeezed on both sides – women being encouraged in an amazing way through prayer. They dared us, and I dare you, to take a step today that is out of your comfort zone to move toward whatever God is calling you to do for Him!! If you want to send me an email, I will be glad to pray specifically for you as you take the dare! I encourage you to come back tomorrow to hear an uplifting story of someone who stepped out of her comfort zone to serve the Lord. She is an everyday person like you and me and Charlotte and Natalie recognized her and changed her life through a few acts of kindness. Dare to be who God is calling you to be! This entry was posted in devotional, inspirational, motivational, spiritual on March 7, 2017 by Deanna Young.